The clock is ticking for an innovative plan to recycle a doomed Russian communications satellite that's been stranded in the wrong orbit since its launch last August. One Russian official has said the plan is to ditch the $265 million Express-AM4 satellite over a stretch of empty ocean sometime before March 26. But a company called Polar Broadband Ltd. says the spacecraft can not only be saved, but also moved into a new orbit to provide improved communications services to scientists in Antarctica. Polar Broadband has been discussing its proposal with the Russians for months but hasn't heard anything recently, company officials told SPACE.com. 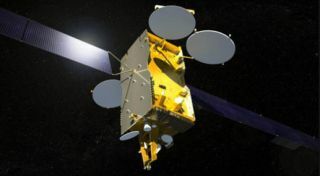 The European aerospace firm EADS Astrium built Express-AM4 for the Russian Satellite Communications Company (RSCC), which is responsible for the country's federal TV and radio broadcasts. The spacecraft carries 12 antennas and 63 transponders and was designed to have a 15-year orbital lifetime. The satellite blasted off atop a Proton rocket on Aug. 18, 2011, bound for a geostationary orbit 22,369 miles (36,000 kilometers) above Earth. But the rocket's upper stage failed, and Express-AM4 wound up in an orbit too low to carry out its original mission. It doesn't have enough fuel to get up to the proper altitude, researchers say. So some Russian officials have apparently decided the best course of action is to destroy the satellite in a fiery atmospheric re-entry. Dennis Pivnyuk, the RSCC's chief financial officer, announced last week that Express-AM4 would be de-orbited sometime between March 20 and March 26. Loucks and his Polar Broadband colleagues aren't taking that as the final word, however. They don't know if Pivnyuk is authorized to speak for the multi-agency Russian working group officially tasked with determining the ultimate fate of Express-AM4, or even if he shares its views. And it's this working group that Polar Broadband has been dealing with all this time, Loucks said. So the company continues to make its case. It wants to buy the satellite, move it to a new orbit and sell its services to new customers. "It's a tremendously capable spacecraft," Loucks told SPACE.com. "It's too bad it didn't get to the orbit they wanted it to get to, but my goodness — now that it's up there, it doesn't take very much to send commands and burn the motors. It's really a trivial cost compared to the cost of getting it up there." Polar Broadband began thinking of alternate orbits and missions for Express-AM4 last year, soon after hearing of the launch failure, Loucks said. The plan they settled on involves sending the spacecraft to a new orbit that could keep it in sight of Antarctica for up to 16 hours a day. A dedicated Antarctic communications satellite would speed the flow of information to and from the frigid continent, improving the efficiency and safety of research efforts there, Polar Broadband officials say. The U.S. National Science Foundation (NSF), as well as other organizations that fund and perform research at the bottom of the world, would benefit greatly from Express-AM4's services, according to Loucks. NSF has "all kinds of instruments and science going on down there that really requires a data rate they can't support," he said, adding that NSF can't afford to build and launch its own spacecraft. "This thing comes along, this is a godsend. This is an amazing thing for them." In explaining the rationale for de-orbiting Express-AM4, Pivnyuk said the orbit it's been stuck in for the past seven months has exposed the spacecraft to high levels of space radiation, raising questions about its lifespan and future performance. However, an analysis led by Loucks determined that the satellite has received at most just one-third of its lifetime dose, so radiation shouldn't be a worry for at least the next 10 years, Polar Broadband officials said. The spacecraft also has enough fuel left for about 10 years of operations in the new orbit, they added. Some Russian officials have also cited the risk Express-AM4 may pose to other satellites. But Loucks contends that Polar Broadband's new proposed orbit would keep the spacecraft out of harm's way for at least the next half-century, and probably longer. While no definitive news from the Russians is certainly not good news for Polar Broadband, Loucks said the company would keep working to save the satellite. "As long as it's not in the ocean yet, there's still hope," he said. "It's a really obvious opportunity — a real capable spacecraft up there that it seems silly to throw away."